On December 1, 2018, Deontay Wilder and Tyson Fury went to war at the Staples Center in Los Angeles live on Showtime pay per view. To be completely honest, they showed up and showed out. In what could have turned into a complete stinker, the fight turned out to be somewhat of a classic. It wasn’t a classic like Joshua-Klitschko or Foreman-Lyle, but the fight had plenty of drama. Deontay Wilder was out-boxed throughout the first half of the fight before coming back and rallying to knock Tyson Fury on his behind not once but twice, the second time in the 12th round. Appearing knocked out cold, Fury got up Undertaker style at the count of nine, and it made not only boxing nerds go insane, but more importantly, casual fans loved it. The momentum from Wilder-Fury seemed like it would not go away. The fight was ultimately declared a draw, and it seemed like they would have an immediate rematch, the winner potentially facing division kingpin Anthony Joshua. Unfortunately, this is boxing and it never fails to let you down no matter how hard you try. The sport found another way to shoot itself in the foot right when the heavyweight division had picked up momentum again. Fury seemed like he had won people over with his story of overcoming addiction and mental health struggles, and had built a lot of steam here in America going into the Wilder fight. Coming back to the boxing ring after being over 400lbs just two years ago, Fury shaved back down to about 256.5 on fight night and boxed brilliantly. Deontay Wilder had also seemed to gain momentum in the past year after he won a tremendous come from behind victory against Luis Ortiz in a fight where he was almost stopped. It felt like America had finally embraced the heavyweight division once again, and it felt like America had discovered that we have a pretty darn resilient heavyweight champion in Deontay Wilder. Then, in February of this year, Tyson Fury and his promoter Frank Warren signed a lucrative and exclusive deal with Top Rank and ESPN for a multi-fight-deal worth over $100 million dollars. When Fury signed with Top Rank, Bob Arum did interviews with multiple media outlets and made several comments about Fury and his stature here in the U.S. To keep it short and sweet, Arum’s most important words are “no one knows who Tyson Fury is in America.” These words are important in context because they, according to Top Rank and Arum, are the reasoning for Tyson Fury backing out of the negotiations for the Wilder rematch which was allegedly at the goal-line before Top Rank swooped in and signed Fury. I’m all for fighters getting as most money as they can, fighting on whatever platform, for whatever promoter they choose, as long as they are making the most they can. The problem is not only the fact that Tyson Fury now fights on ESPN exclusively, but now Bob Arum is Fury’s promoter and Deontay Wilder is still with advisor Al Haymon. The history between Arum & Haymon does not need to be explained, but it makes the fight ten times harder to be made than it was before. I’m not completely opposed to Fury building his stature and taking an interim fight here in the U.S., same for Wilder, but I’m worried the fight still won’t get made after those interim fights because of the strained relationship of Arum and Haymon/PBC. If both Wilder and Fury get through their interim bouts in May and June, the fight can be even bigger and do even better PPV numbers than the first one did in my opinion, especially if the fight lands on ESPN PPV. Either way, ESPN will be involved, and Wilder and Showtime have stated they would be open to doing a joint PPV if it came down to it, and I think that can get done if the deal can be made. If the fight is big enough, those are all political hairs to be split after the deal is made for the fight. If the money is there, and the fans call for it enough, history tells us, the fight will almost always get made. As for the division as a whole, Wilder-Fury is not the only fight we hope gets made this upcoming fall. With Anthony Joshua and Jarrell “Big Baby” Miller squaring off in June at Madison Square Garden, the hope is that if (when) Joshua runs through Miller, he and Wilder can make a deal for the fall. But again I ask the most fun question of them all, what network will air on? With Joshua on a fight by fight basis with DAZN and Wilder on what seems to be the same relationship with Showtime, we can only hope that the fight can be promoted by both DAZN and Showtime. Ultimately, I think Eddie Hearn will let Joshua fight Wilder on Showtime PPV, but I don’t know if DAZN will go for that. DAZN is not in the PPV business as of yet, so that could be one of the main obstacles that stand in the way of that fight being made next. Besides the obvious issues of money splits, percentages, PPV or no PPV, what network the fight will be on, we are several speed bumps and roadblocks away from Joshua-Wilder being made. Unfortunately, this fight is slowly turning into Lewis-Bowe, which is exactly what we all hoped it wouldn’t turn into. Not only are fans getting fed up with the negotiations and the ‘he said she said’ between networks and promoters, but Deontay Wilder is not getting any younger. Wilder will be 34 in October, and while I don’t think the fight is close to being expired just yet, the marinade on the steak is really starting to seep in at this point. I’m all for the business of boxing marinating on certain fights and such, I see the point of it, and it is needed in many cases. There are many writers and pundits who constantly complain about every fight not being made right when the guys are smack dead in their primes, and I get that, but if you know the sport, you know how this works. Not every fight can be Leonard-Hearns I. With all the talk of networks and promoters, a Cold War in the heavyweight division seems upon us. This leaves several fighters I’ve yet to mention kind of sitting out in the cold. Guys like Oleksandr Usyk, who is moving up to heavyweight from cruiserweight, Dillian Whyte, and Luis Ortiz. They aren’t in my top 3 at heavyweight but can make their way in depending on their next few months. There are several fun fantasy match-ups that we can make in our head, but will the fights get done? Is Luis Ortiz going to fight Joe Joyce, or are we going to keep watching Ortiz go 12 with guys like Christian Hammer? I know it’s not Ortiz’s fault he’s not getting the fights he wants because he will fight anyone, but it just seems like top fighters are facing everyone other than the guys they are supposed to. Dillian Whyte is blah, although he can crack, and a fight between him and Wilder piques my interest, but I don’t see that fight happening unless Whyte signs with Haymon/PBC. There were reports of Whyte signing a multi-fight-deal with Top Rank just a few weeks ago, but all signs are pointing to him staying with Hearn/DAZN for the time being. Usyk is an interesting case. He is currently with Matchroom/K2/DAZN, and has moved up to heavyweight. The objective would seem to be to line him up against Joshua sometime next year for a big fight in the U.K. With a few fights at heavyweight under his belt, I think he can beat Joshua, although I don’t know if he can handle Joshua’s power. Either way, I love that fight, and hope/think it eventually happens. Whatever happens over the next half of a year, I don’t think we’ll see Anthony Joshua fight Deontay Wilder. I said two years ago that I did not think the fight would happen until summer 2020. Ironically, so did Joshua in an interview several years ago. 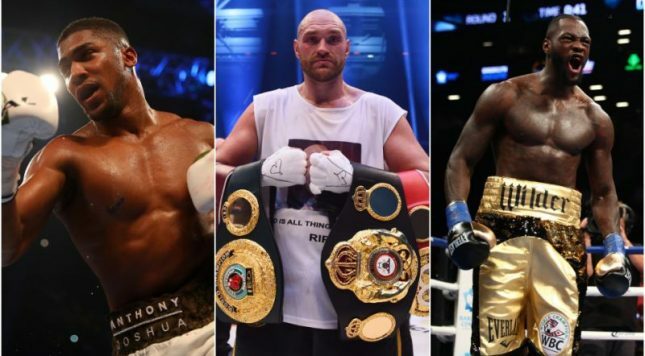 With Joshua-Wilder not only being probably the best fight in the division, but the most important because it gives us a unified heavyweight champion, we can only hope it happens. At some point, just like always, if the fight is big enough and there is enough outcry from the public, usually the fights get made. Will the public continue to demand it enough that we force their hand to get the deal done? It hasn’t been enough yet. Until then, though, we will have to continue to settle for what they are giving us now, which isn’t exactly what we want, but we aren’t exactly whining loudly enough either.